Die Jovis, 8° Decembris 1831. Ld. Middleton takes the Oaths. Bush et. al. v. Locke. Baillie v. Grant, Petition to revive Appeal, referred to Appeal Com ee. Cameron v. Mackie et al. Respondents Petition to lodge their Case, referred to Appeal Com ee. Whittet & Greig v. Johnston et al. Respondents Petition to lodge their Case, referred to Appeal Com ee. Finlay et al. v. Whyte et al. Gibson v. Kirkland & Sharpe. The King's Answer to the Address. India & China Trade, &c. Accounts respecting, Ordered. Message to H.C. for Report on The East India Co's Affairs. Hops & Malt Duty, Returns respecting, Ordered. 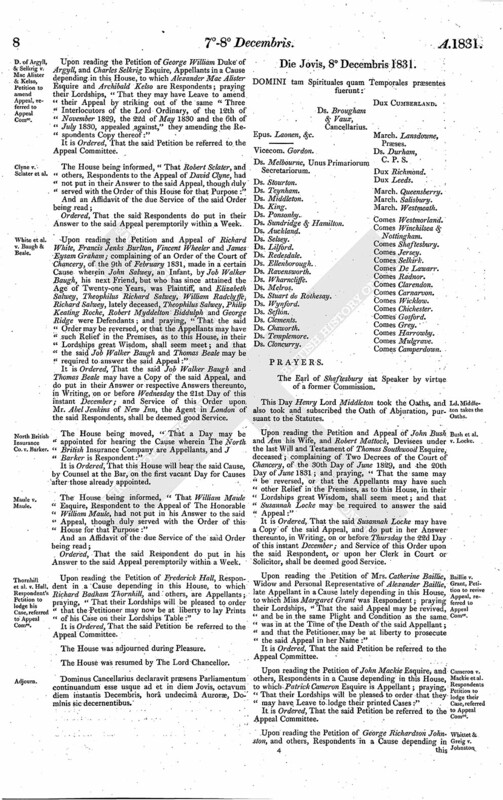 Anatomy, Petition of Physicians, &c. Hunterian Society forfacilitating the Study of. This Day Henry Lord Middleton took the Oaths, and also took and subscribed the Oath of Abjuration, pursuant to the Statutes. Upon reading the Petition and Appeal of John Bush and Ann his Wife, and Robert Mattock, Devisees under the last Will and Testament of Thomas Southwood Esquire, deceased; complaining of Two Decrees of the Court of Chancery, of the 30th Day of June 1829, and the 20th Day of June 1831; and praying, "That the same may be reversed, or that the Appellants may have such other Relief in the Premises, as to this House, in their Lordships great Wisdom, shall seem meet; and that Susannah Locke may be required to answer the said Appeal:"
It is Ordered, That the said Susannah Locke may have a Copy of the said Appeal, and do put in her Answer thereunto, in Writing, on or before Thursday the 22d Day of this instant December; and Service of this Order upon the said Respondent, or upon her Clerk in Court or Solicitor, shall be deemed good Service. Upon reading the Petition of Mrs. Catherine Baillie, Widow and Personal Representative of Alexander Baillie, late Appellant in a Cause lately depending in this House, to which Miss Margaret Grant was Respondent; praying their Lordships, "That the said Appeal may be revived, and be in the same Plight and Condition as the same was in at the Time of the Death of the said Appellant; and that the Petitioner may be at liberty to prosecute the said Appeal in her Name:"
Upon reading the Petition of John Mackie Esquire, and others, Respondents in a Cause depending in this House, to which Patrick Cameron Esquire is Appellant; praying, "That their Lordships will be pleased to order that they may have Leave to lodge their printed Cases:"
Upon reading the Petition of George Richardson Johnston, and others, Respondents in a Cause depending in this House, to which Mrs. Jane Whittet or Greig, and Alexander Greig her Husband, are Appellants; praying, "That their Lordships will be pleased to permit their Case to be lodged within a Week:"
The House being moved, "That a Day may be appointed for hearing the Cause wherein Kirkman Finlay Esquire, and others, are Appellants, and Thomas Whyte, and others, are Respondents, ex-parte, the Respondents not having put in their Answer to the said Appeal, though peremptorily Ordered so to do:"
The House being moved, "That a Day may be appointed for hearing the Cause wherein Archibald Gibson Esquire is Appellant, and John Kirkland and John Ferguson Sharpe are Respondents:"
The House being moved, "That a Day may be appointed for hearing the Cause wherein John Edwards Vaughan is Appellant, and Thomas Gronow Clerk is Respondent:"
"I thank you for this loyal and dutiful Address, which I have received with the greatest Satisfaction. "I rely with perfect Confidence on your Attachment to My Person and Government, and on your zealous Co-operation in maintaining the Honour of My Crown, and the Safety and Welfare of My People." Ordered, That all Accounts relating to the Trade of India and China, and to the Finances of India, which were presented to this House by His Majesty's Command in 1829 and 1830, and in the present Year, and all such further Accounts relating to the same Matters which have been Ordered by this House, or prepared for the Committee on the Affairs of The East India Company, during the Year 1830, be completed to the latest Period to which the same can be made up, and laid before this House within Twenty-one Days after the Christmas Recess. 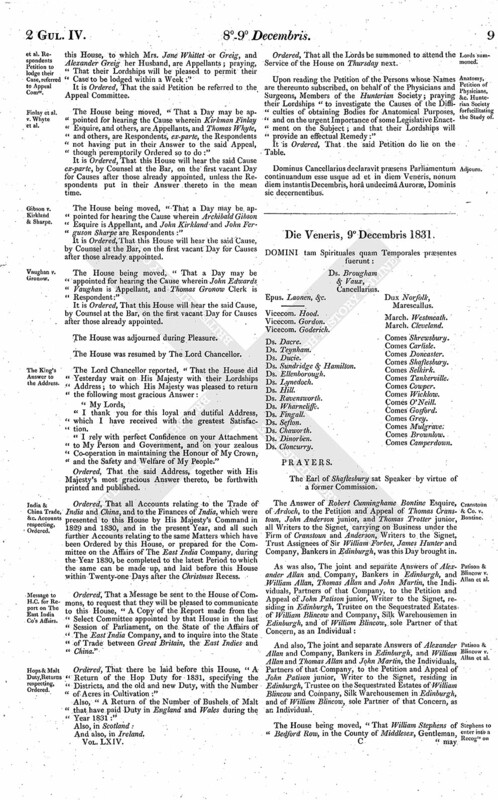 Ordered, That a Message be sent to the House of Commons, to request that they will be pleased to communicate to this House, "A Copy of the Report made from the Select Committee appointed by that House in the last Session of Parliament, on the State of the Affairs of The East India Company, and to inquire into the State of Trade between Great Britain, the East Indies and China." Ordered, That there be laid before this House, "A Return of the Hop Duty for 1831, specifying the Districts, and the old and new Duty, with the Number of Acres in Cultivation:"
Also, "A Return of the Number of Bushels of Malt that have paid Duty in England and Wales during the Year 1831:"
Upon reading the Petition of the Persons whose Names are thereunto subscribed, on behalf of the Physicians and Surgeons, Members of the Hunterian Society; praying their Lordships "to investigate the Causes of the Difficulties of obtaining Bodies for Anatomical Purposes, and on the urgent Importance of some Legislative Enactment on the Subject; and that their Lordships will provide an effectual Remedy:"
Dominus Cancellarius declaravit præsens Parliamentum continuandum esse usque ad et in diem Veneris, nonum diem instantis Decembris, horâ undecimâ Auroræ, Dominis sic decernentibus.